Each week, we bring you an app that’ll make your life surprisingly easy. This week, we’re going to help you find important stuff in your vicinity with AroundMe. 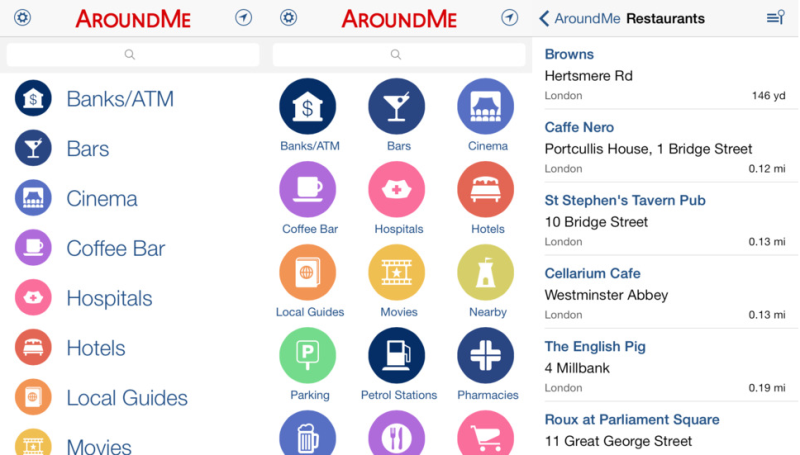 AroundMe uses your phone’s GPS to find banks, cash machines, petrol stations, hotels, supermarkets, cinemas, bars and plenty more around your current location. It’s extra-handy if you’re hopelessly lost in a new city, or if you’re desperately hunting for a cash machine on a night out. AroundMe doesn’t just tell you where stuff is; it provides directions too. It’ll tell you how far away you are from each location as well, so you can plan activities ahead of time. If you’re meeting someone, you can email relevant information over to them so they can find you easily. No more ‘oh, sorry, I got lost!’ excuses for being late! Clicking on a listing brings up more information from Foursquare and Google, allowing you to read reviews, find contact details and get handy tips before you commit to going anywhere. You can bring up information from Wikipedia if you want to impress people with your knowledge of local landmarks too (which is especially useful if you’re meeting someone for a date and want to appear cultured). The free version of AroundMe comes with adverts, although these can be removed for the reasonable sum of £1.99. A quick browse of reviews on the App Store and Google Play suggests that the app brings up some out-of-date information (such as listings for long closed-down pubs) from time to time as well. If you’re unsure, your best bet is to double-check by ringing the business or asking a local (don’t be shy, we’re sure they’re lovely). Have you used an app that has made your life surprisingly easy recently? Share it with us in the comments and we may cover it in a future post! And if you’re looking for a surprisingly easy way to declutter before Christmas, look no further than musicMagpie (we even accept mobile phones! ).